If you would like to make a reservation, please follow these 7 easy steps. We only accept online reservations. Thank you! Once you click on the link to make a reservation, you will be redirected to our online scheduling site. Under "Make a Reservation," choose the location you'd like to visit. In our demo, we're choosing to make a reservation for B Bar® in Novato. Once you choose a location, the next window will appear; see STEP 2 below. It's best to keep all pre-filled selections as they are and simply click "Search". Find the day you'd like to come in and click on "Book" next to the time you'd like to reserve. In our demo, we're choosing 1:30 pm on Saturday, August 4th. Once you click "Book," a window will pop up requiring you to either log in or create a new account. Please see STEP 4 below. If you've never been to B Bar®, you'll need to create an account. Fill in your email address and click "Next". If you've previously made a purchase at B Bar®, you'll already have an account. 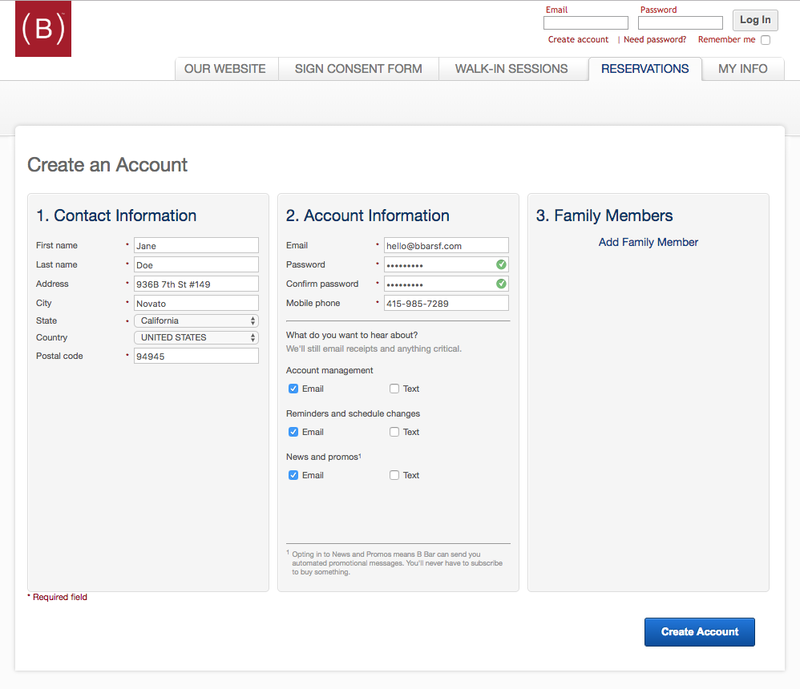 If you've logged in before, enter your email address and password, and click "Log In". If this is your first time logging in to your account, enter your email address you originally gave us, leave the password field empty, and click on the phrase that reads "Need new password?" — that will allow you to assign a password to your existing account. Skip ahead to step 6 or 7, depending on if you have a credit card on file or not. For new accounts, please fill in your contact information. Make sure your email is correct, choose a password and enter it; confirm the password you just entered and, when you're done, click the button that says "Create Account". Enter your credit card information to securely hold a card on file that you can use for future purchases and click the button that says "Resolve". If you're unable to complete this section or prefer to pay in cash, simply click the button that says "Ignore". 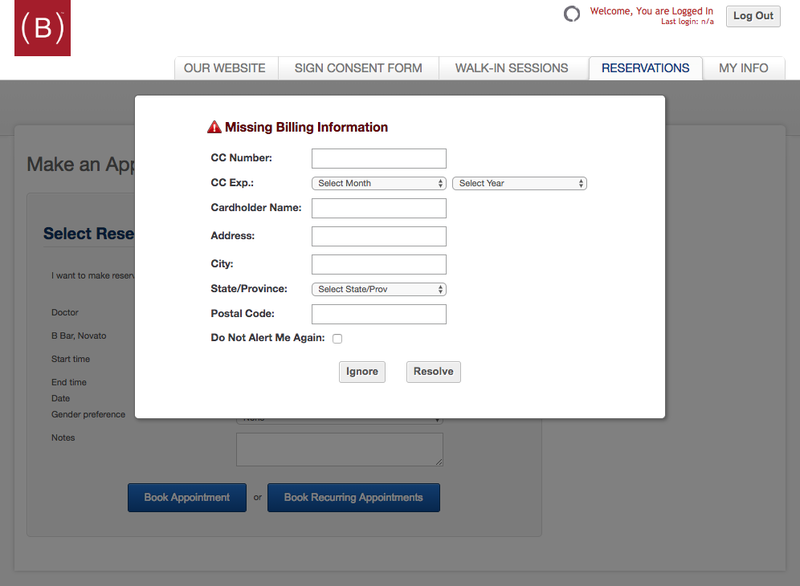 Select or confirm reservation details and enter any notes you'd like us to see regarding your upcoming visit. You may choose to let us know what shot or shots you'd like. To book your reservation, either click "Book Appointment" or "Book Recurring Appointments" if you'd like to make this reservation ongoing for future dates. Your reservation has been completed! If you need to make any changes—cancel or reschedule, you may do so on this screen or by logging into your account in the future. If you have not completed and signed our CONSENT FORM, you will need to do so before you can receive a shot at B BAR®. The link will direct you away from our website and to the SmartWaiver site. Once completed online, you will need to confirm your submission, so be sure to look for the confirmation email in your inbox— it might land in your junk folder, so be sure to look there if you don't see it.